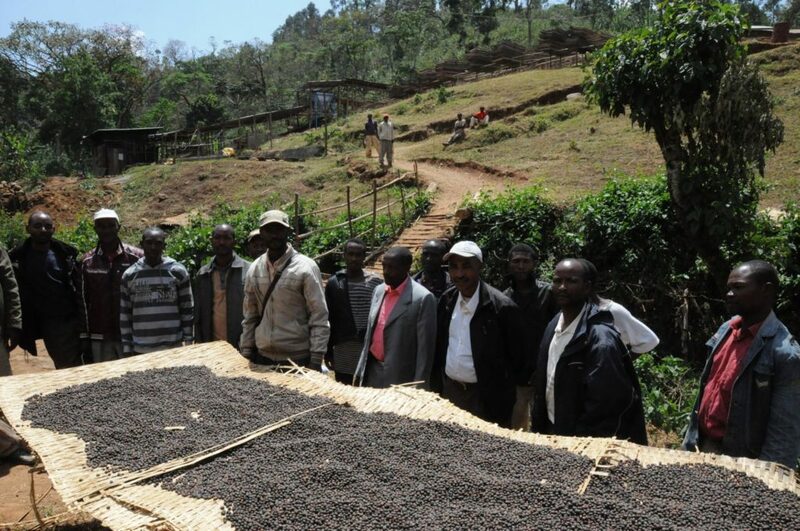 It’s no secret that our team loves coffees from Ethiopia. As the birthplace of coffee, its climate, altitude, and nutrient-rich soil are MADE to grow coffee. And with its incredible diversity of flavor and characteristics among the country’s coffee-growing micro-regions, there is always something for everyone and there is never a boring or predictable cup. When we sample roasted and cupped this Adado, it was a no-brainer; we snatched up as many bags as we could! Named after the Adado wash station, this coffee comes from several different farmers in the village of Shara in the Yirgacheffe region of Ethiopia. 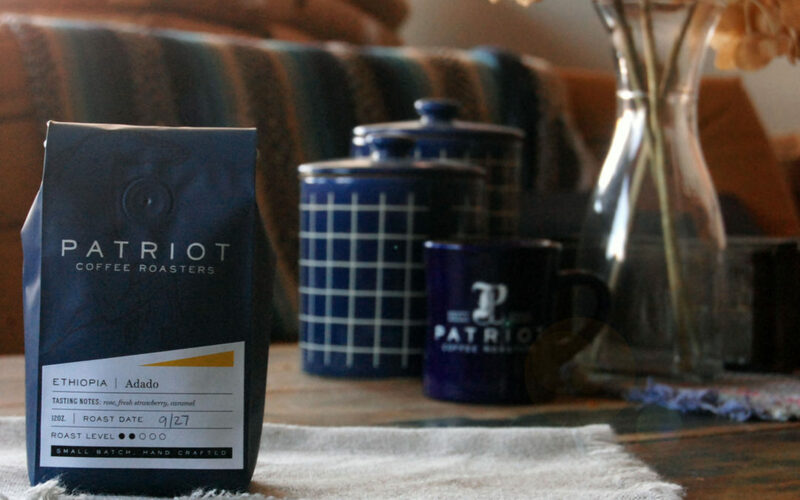 It’s a naturally processed coffee with nuanced florals and a distinct fresh strawberry flavor. In the cup, it’s sweet, and delicate with distinct notes of rose, strawberry, and caramel. The balanced acidity and tea-like finish round out a complex and exciting brew. This coffee offers a unique experience with each brew method. Some, we enjoyed more than others, but overall we appreciated each for what they brought to the table. We really enjoy the diversity offered by this coffee, and its ability to transform itself with each brew method. We ranked our favorites based on overall balance and clarity of flavors. For the first time in Patriot history, we were a hung jury! We couldn’t decide between the Chemex and the batch brewer because they both offered something different, but equally enjoyable. We thought that the Chemex provided a balanced brew that highlighted all the aforementioned flavor notes. Delicate, fresh strawberry, cane sugar, soft, and floral. It reminded us of dipping fresh strawberries in granulated sugar, with an added grapefruit juice acidity. While the Chemex offered fresh strawberries, the drip brew was more reminiscent of strawberry jelly. It was caramelly sweet with a slightly denser body, and an overall clarity and balance of flavors. We agreed that we would all be equally satisfied with either brew method for this coffee! Coming in a close second, the French Press made an excellent cup of coffee. Surprisingly clean and delicate, we enjoyed the balanced acidity and heavier body. It offered lots of sugary rose notes lingering on the nose, a fresh strawberry finish, and plenty of sweetness in between. It was only edged out of first place by the intensity of flavor offered by the other two brew methods. Aeropress found itself in third place for this coffee. Still an enjoyable cup (second place for our apprentice), it offered a lot more grapefruit acidity than the other methods. It was very bright and sweet, with barely-there notes of deciduous fruit like apple or pear, and a delicate, tea-like body. However, we found ourselves missing the coffee’s distinct strawberry notes, and we found the acidity a bit harsh in the finish. For those experimental coffee-drinkers out there who love the bitter-sweetness of grapefruit, the Aeropress is a great way to enjoy this coffee. The wave left some things to be desired. It certainly wasn’t a BAD cup, but while other brew methods were sweet and berryful, the Kalita had noticeably less intensity of flavor. It was so delicate and light bodied that it reminded us much more of tea – and a tannic finish only contributed to that experience. We would recommend this brew method for those who prefer tea over coffee, but we found ourselves wanting more. Our advice? Stick to a drip brewer or a Chemex. Can I buy your coffee on Amazon?